Will you be packing lunches this school year? No lunch would be complete without special lunch box notes. Starting today at my house, summer officially is over. My kids went back to school this morning. The summer just flew by but everyone was happy to go back to our school routine. Last year I started adding in lunch box notes into my daughter’s packed lunches. She loved it, it was something she looked forward to every day. She asked me if I could do that again this year. My son who started kindergarten this morning can read now so he chimed in asking if he can have special lunch box notes just like his sister. These free printable lunch box notes are perfect for younger readers, just as a little reminder for them that I am thinking about them while they are at school. One is blank that you can fill out for those really special days to personalize a cute message or send a reminder for your child. 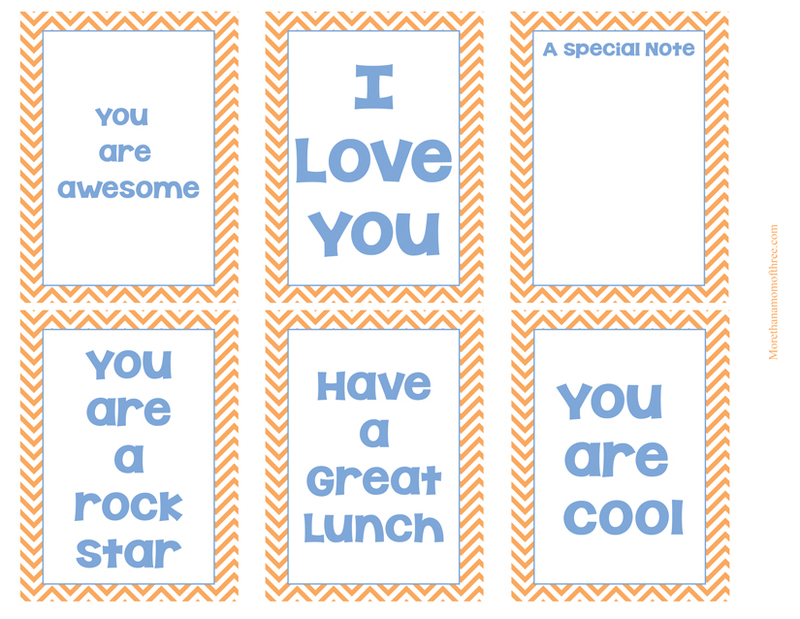 Download the free printable lunch box notes and surprise your child each school day with a special note just for them. Love these for their lunches! I did this last year, and my oldest really liked them! These are too sweet. I love the idea of fun lunch box notes tucked in for them each day. I love adding notes to kiddo’s lunch bag. I still do notes for both of my kids. The teen likes and the soon to be 1st grader says it’s for babies, lol. Go figure, right? 🙂 These are cute ones you have up! Those are super cute. I bet my daughter would love these in her lunch. Mistee Dawn recently posted…On Wings Of Chaos by Travis Simmons – Book Review, Tour & Giveaway! Aw these are great! I need to pass these on to my sister so she can sneak them into my nephew’s lunch box! What a great idea to put loving notes in with the kids lunches! I am sure they will appreciate it even if they don’t let you know! How cute to put one of these printables in a kids lunch box. What a surprise they would have. You know… once you start this, they are going to want it all the time. I really like this idea of putting notes in lunchboxes to let kids know you are thinking of them and encouraging them. these are so cute i know my daughter would love if i wrote her these once in a while. I love these! I enjoy putting a note in my daughter’s lunch box and she thinks it is so fun. I am going to print these for her! These are very cute! I bet my niece would enjoy them! I think lunch box notes are so sweet. Kids really need love and encouragement from their parents, and what a cute way to add to that! Just saw your post on Twitter. Love these super-cute lunch box notes! Thanks for sharing! I wrote a few sticky notes the first few days. I may do a few more surprise ones. Love adding little notes to lunches. Thanks for making these and sharing. Would love if you came and linked up to the Merry Monday Link Party too. Thank you for the free prints. I’ve been writing on my son’s napkin, but I like these better. Super cute! You are welcome, hope he likes them. Thank you for these…I’ve been looking for something like this to slip in his lunch box! You are welcome, hope he enjoys them! I love these!! So cute! I see all these back to school lunch notes and think I really need to print these and actually do them!